Chef Haidar Karoum stuns with globally inspired Chloe. Haidar Karoum has always preferred to let his food speak for itself while he eschewed the limelight. That never stopped him from earning endless accolades and a chef of the year RAMMY for his trio of scene-setters—Proof, Estadio and Doi Moi—which he left in the spring of 2016. Now he’s back with his debut solo venture, Chloe, which thrusts him onto center stage like never before. The 3,200-square-foot, 105-seater eatery lives on a busy corner in Navy Yard, just a few blocks from the ballpark and the Anacostia River. Everywhere you look outside the restaurant, there’s a new building going up. Inside, though, a calmer atmosphere prevails. There’s a stripped-back modernism enlivened with woody textures, earthen tones and restrained lighting. Hanging shelves garnished with plants frame the showcase kitchen, which is rimmed with counter seating for 14. Sit here if you can: You’ll have a front-row seat for all the action. The eminently shareable menu—listed from lighter fare to large-format entrees—is a globe-hopping journey that plays to the chef’s many strengths. Expect forays into Asian, New American and European traditions. A dainty mix of brined bites—cornichons, olives, pickled garlic and peppers—is a nice note on which to begin. So is the fluffy Sardinian ricotta drizzled with local raw honey. Slather it on the slices of crunchy country bread that bear a switchback of grill marks and a brushing of olive oil. Karoum has a deft hand with vegetables, honed during his time working for famed chef Nora Pouillon. Halved bok choy are cooked in what the chef calls “a little Japanese love”: soy, sake and sesame. These additions don’t overwhelm; the delicate sweetness of the greens dominates. Golden florets of roasted cauliflower come lavished with tahini, finely chopped mint and some crunchy pine nuts. Meanwhile, a butter-rich trumpet mushroom sauce complements tender knuckles of gnocchi. The design scheme of the bar area at Chloe is at once restrained and well-appointed. 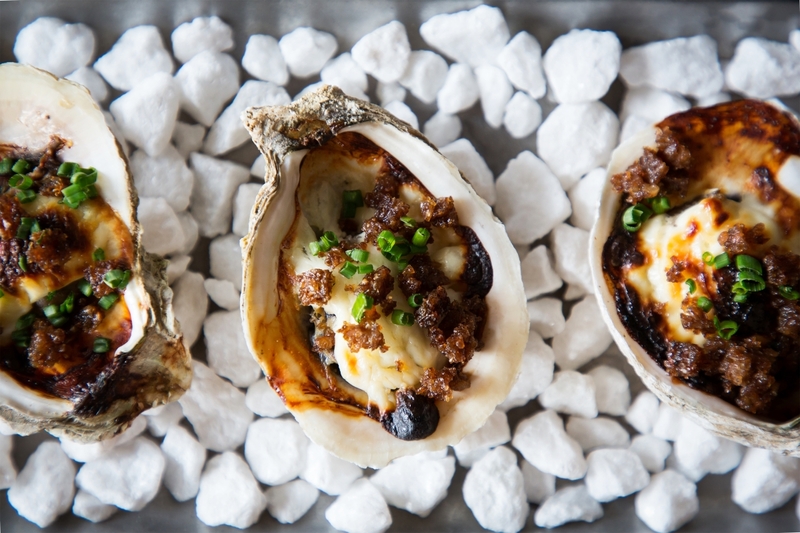 For those in the mood for more aquatic delights, go with the Whitestone oysters, served on a riverbed of smoothed pebbles. The broiled shellfish are topped with horseradish-spiked creme fraiche and rye crumbles, evoking a Scandinavian sensibility. Inspired by the other side of the world, the cured cobia crudo is blessed with an assertive, but not overpowering, play on Vietnamese nuoc cham sauce forged from fish sauce, lime juice and a surprising dash of ginger. Crispy whole dorade (subject to change) draped with fresh cilantro is the real showstopper. Served standing upright on a bed of sticky rice, it looks like it’s about to swim off the plate and into the dining room. Pull off strips of fried skin to reveal the white flesh with a surprisingly creamy texture underneath. Find yourself back on land with the pistachio-studded pate campagne complemented by charred scallion mustard. A flowering of pickled radish sits on a field of toasted almonds, hummus and sauteed ground beef hiding a harissa afterburn. A puff of hot air escapes the accompanying fluffy flatbread when you rip it apart. Use it to scoop up every last bit of this deeply satisfying dish. Then take a trip to Bavaria with white sausage in a taut casing that holds in the juicy meat. It sits on a bed of spaetzle dotted with reconstituted golden raisins and ribbons of cabbage. Desserts are a more domestic proposition. There’s a fudge brownie sundae that hits all the right notes. A Meyer lemon tart arrives with torch-tinged meringue blossoms and a cascade of saucy blueberries. Panna cotta accented with chai comes topped with spiced pears and a charming pecan brittle that would be a worthy treat on its own. By the end of your meal, you feel like you’ve been around the world. However, the disparity of geographic influences stays tightly bound together by the chef’s top-notch technique and ability to conjure deep flavors. It’s quite a show—one that you won’t soon forget. The Hanky Panky mixes barrel-rested gin, sweet vermouth and fernet.